The McAllen Performing Arts Center houses the largest stage south of San Antonio. ERO Architects of McAllen partnered with New York-based Holzman Moss Bottino Architecture on the 93,471-square-feet structure — a unique effort that united Texas with Big Apple performance meccas. 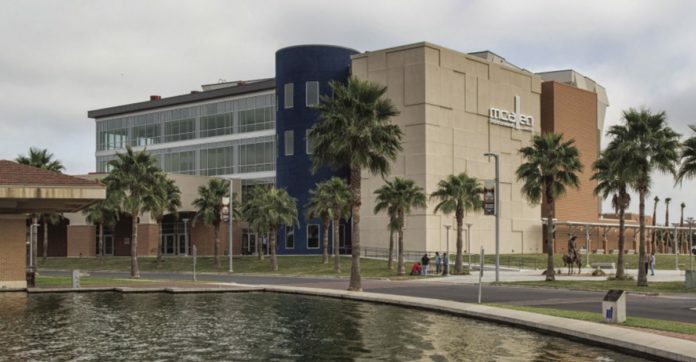 At three stories tall, the McAllen PAC features a 1,847-seat theater over four levels and a multi-purpose room of more than 2,300 square feet. It was completed in 2016. Adjustable acoustics allow for a range of music and performances, paired with a robust acoustical shell with a celestial ceiling. A hydraulic stage and orchestra lift provide differing configurations. The Architecture of the Lower Rio Grande Valley Photography Project (ALRGV) is a comprehensive visual database of architecturally significant structures in the Rio Grande Valley of Texas — Cameron, Hidalgo, Starr and Willacy counties. Deval “Pino” Shah is the photographer on the project with accompanying narratives provided by Stephen Fox and Rochelle Hawk. For more information, visit ArtByPino.com. A new photo of local architecture will run in Festiva weekly.